Today (9/8/2015) is the 16th anniversary of my husband’s kidney/pancreas transplant. We don’t know much about his deceased donor: 36 years old, from Ohio and her name was Mary. My husband is not Catholic, so he wouldn’t understand the significance. He received the gift of life from a woman named Mary on the Feast of the Blessed Virgin Mary’s Nativity. I didn’t make the connection myself untIl about five years ago. We are going to dinner to celebrate. I decided to swap out my purse for one that’s not as summery. 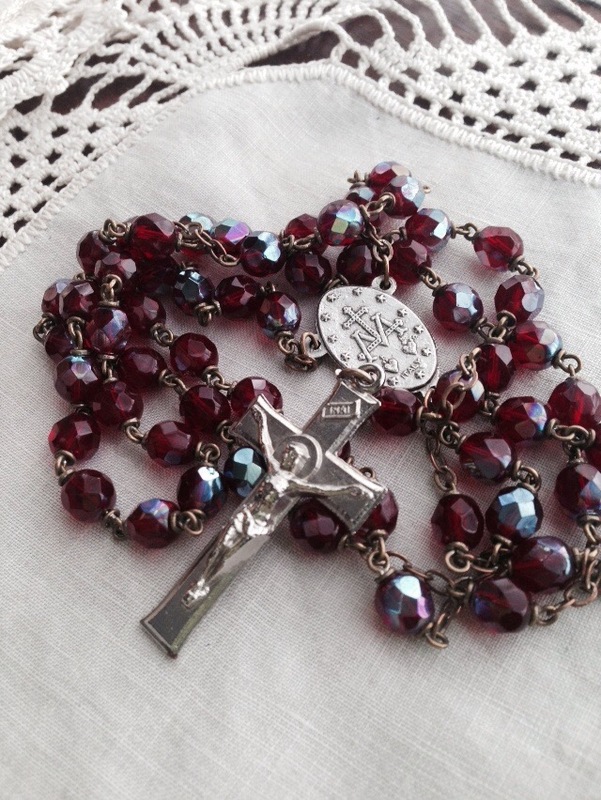 I was delighted to find my mom Marie’s rosary. It’s the one she got in Rome. She held it in her casket and it was given to me because no one else wanted it. Too creepy. I thought that I had lost it and I was sick about it. Several months ago, I did an exhaustive search for it. Prayers to St. Anthony went unanswered until today. What a nice surprise to reach into an out of the way pocket of an old purse and find this treasure! So to the Mary the Mother of Jesus, Mary the organ donor from Ohio and my sweet mom Marie, thank you for the special gifts.